Introducing our collection of Pissarro art for sale. Camille Pissarro (1830-1903) is considered to have been one of the masters of Impressionism. Pissarro was the oldest member of a group of major Impressionist artists, including Monet, Cezanne and Renoir, and was the only painter to exhibit at all of the Paris Impressionist Exhibitions. He was influenced by Corot, especially in his fondness for painting outdoors (in "plein air") and, like Jean-Francois Millet, was famous for his scenes of rural and peasant life. For a few years he experimented with pointillism and Neo-Impressionism; he also influenced Gauguin and other Post-Impressionists. 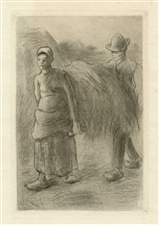 Pissarro paintings are well known to the world, but it is of course his prints which are of special interest to us and here we are proud to present a selection of his etchings. 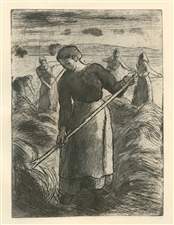 His son Lucien Pissarro was also an accomplished artist, and we feature some of his woodcuts. 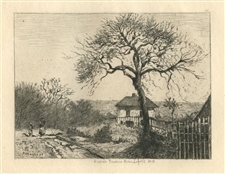 Camille Pissarro etching "La veillee"
Medium: etching (after the painting). This beautiful piece was etched by Auguste Lauzet after Camille Pissarro, and published in Paris in 1892 by Chamerot et Renouard, for the very rare volume "L'Art Impressionniste", featuring etchings after important artworks in the private collection of M. Durand-Ruel, which was at the time was one of the world's foremost collections of Impressionist art. This print is a fine impression printed on cream laid paper, with a platemark (not shown here in this photo) and good margins; the plate measures 6 x 4 3/4 inches. Not signed. A nice find, with no others currently offered on the market. Medium: woodcut. Executed by Lucien Pissarro after the composition by his father Camille Pissarro. Published in Paris in 1906 by Floury for the rare 1906 first edition of "Histoire des Peintres Impressionnistes" by Theodore Duret. Printed on smooth wove paper. Image size: 4 3/4 x 6 3/4 inches (120 x 170mm). Signed in the block (not by hand).